Here, the cases of Pakistan, Iran and Djibouti will allow us to understand how the Chinese political, military and business authorities are entangling the economic, political and military needs and interests of China in the integrated grand strategy of the New Silk Road. In 2015, Pakistan and China signed the mammoth deal known as the “China-Pakistan corridor”. 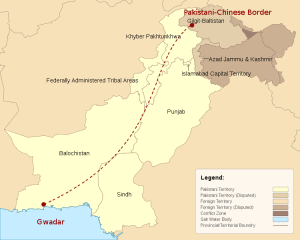 This agreement allows Chinese companies to build railways and highways from the Chinese Xinjiang region to the Pakistani port of Gwadar, on the Arabian Sea, close to the Iranian border (“China, Pakistan sign gas pipeline deal key to Iran imports”, Press TV, April 21, 2015). In exchange, Chinese energy companies are building coal and solar plants in Pakistan, in order to help alleviating the Pakistani structural electricity crisis. This deal is based on the construction of transport infrastructures that reach the resources extraction spaces of interest to China, in exchange for the development of infrastructures, investments and programs of interest to the host country (Valantin, “China and the New Silk Road: the Pakistani strategy”, The Red Team Analysis, May 18, 2015). Relatedly, in January 2016, China handed over two Chinese military ships, equipped with state-of-the-art guns, to the Pakistani navy (Behram Baloch, “China hands over two ships to Pakistan for maritime, security”, Dawn, January 16, 2017). These ships are based in the port of Gwadar (Ibid). 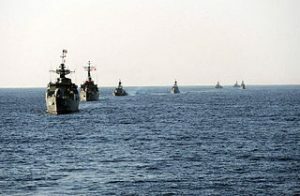 With these ships, the Pakistani navy has the means to patrol and secure not only the maritime zones of Pakistan, especially for search and rescue operations, but also the sea route of the China-Pakistan Economic Corridor between Gwadar and the Persian Gulf, these lanes being crucial to then navigate towards the Malacca strait and the Chinese coastal cities. This dynamic is perpetuated with Iran (Jean-Michel Valantin, “Iran, China and the New Silk Road”, The Red (Team) Analysis, January 4, 2016). Since 2013, the Iranian and Chinese navies are developing ties. On 4 March 2013, an Iranian military fleet, which had left the Iranian port of Bandar Abbas, docked at the Chinese port of Zhangjiagang, after a forty days journey (“Thread: Iran 24th fleet heading for Malacca Strait after Chins stop: Navy Cmdr”, Pakistan Affairs, 7th march 2013). The Diplomat, May 06, 2014). On 23 September 2014, this declaration was followed by the first joint naval exercise between the Chinese navy and the Iranian one, after the docking of a Chinese military flotilla at the Bandar Abbas port (Ankit Panda, “China and Iran’s historic naval exercise“, The Diplomat, Sept. 23, 2014). In December 2015, the heads of the Chinese and of the Iranian Navies met in Teheran, in order to elaborate and deepen cooperation ties (Saima Ali, “Maritime security and Pak-China cooperation”, Pakistan Observer, December 4, 2016). These ties are of strategic importance to China because of the Strait of Hormuz, which commands access to the Persian Gulf. They develop as China and Teheran have signed a New Silk Road deal, allowing Chinese ships to unload their cargo in Iran’s southern ports, from where the cargos will be transported by land to Central Asia and European countries (“Iran, China seal New Silk Road deal”, Press TV, 31 October, 2016). January 30, 2017). As we saw (ibid. ), this base is connected to Addis Ababa, capital of Ethiopia, by a railway recently rebuilt by a Chinese company. Djibouti plays a key role in an opening up of the New Silk Road to northern East Africa, to the Red Sea and thus to the Mediterranean sea through the Suez canal (Shannon Tiezzi, “China’s “Maritime Silk Road”: don’t forget Africa”, The Diplomat, January 29, 2015). 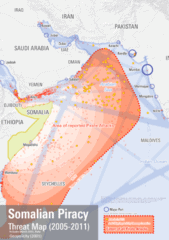 Through this move, the Chinese notably assert their intention to protect Chinese ships from the endemic piracy that plagues these waters, nicknamed “the pirates lake” (Valantin, “Somali Piracy: a model for tomorrow’s life in the Anthropocene?”, The Red (Team) Analysis Society, October 28, 2013). China thus adopts different and very pragmatic ways to militarize some important segments of its maritime New Silk Road. 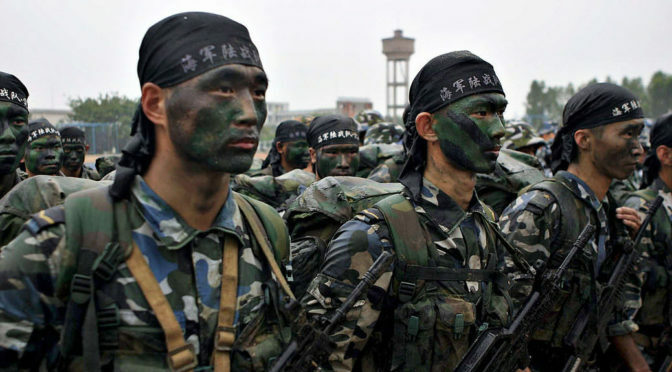 In the South China Sea and in Djibouti, this militarization is directly implemented by the Chinese People Liberation Army, while it takes the form of capability reinforcement with the Pakistan fleet and “simply” of joint manoeuvres with Iran. The militarization of nodes and segments of the maritime New Silk Road, as also pointed out in the case of the South China Sea, is deeply tied to the fact that the Middle Kingdom is working at securing its access to natural resources (Michael Klare, Rising Powers, Shrinking Planet, 2008). The basic strategic meaning of this militarization trend lies in the political will to secure the flow of commodities towards China. This flow must remain uninterrupted (Dambisa Moyo, Winner take all, China’s race for resources and what it means for us, 2012). Thus it must be guarded against any kind of disruption, which could be brought about by armed coercion, conflict or piracy. This security need derives from the fact that the inner development of China is now dependent on the constant import of commodities. For example, since 2013, China has become the first importer of oil, with 7,4 million barrels per day imported, while the US imports 7,2 millions barrels per day (“China is now the world’s largest oil net importer of petroleum and other liquid fuels”, US Energy Information Agency, 2014). Furthermore, China also needs natural gas, minerals, water, and food, to maintain the pace of growth of its economy and, even more important, the improvement of the living conditions of its 1,4 billion strong population. Indeed, social and economic development and growth have become the very basis of the social contract in China and its political authorities derive their legitimacy from their continuation (Loretta Napoloni, Maonomics, 2011). The Chinese New Silk Road is nothing else but the “planetary channel” implemented by China to guarantee and defend commodity in an age of growing natural resources depletion. Thus, securing the New Silk Road by militarizing it is a mean to ensure the global commodity flow that this mammoth country needs. In other words, China has become a global power, but it must be understood from the Chinese point of view: China is, and has, a global “power of need”. This immense need, which emerges from the sheer scale of China, and from the way the different Chinese commodity needs are creating a global system of needs, demands to protect the “One Belt, One Road”. “OBOR” is nothing else but the “planetary channel” implemented by China to guarantee and defend commodity in an age of growing natural resources depletion.